My husband Jeff and I are going on an adventure to the Sax-Zim Bog which is about fifty miles north west of Duluth, Minnesota. We will be traveling with my sister and brother- in- law. 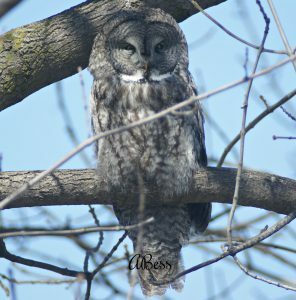 Our goal is to see the largest owl in North America…the Great Grey Owl. Sax-Zim Bog is the place to see one and this time of year is the best chance too. Of course we will be looking at temperatures falling to 9 to 11 below zero for our morning birding with highs in the low teens or low twenties. That doesn’t include wind chill factor. Sounds great right!? We were going to go back in December but the heavy snow forecast kept us away. So we decided that February was going to be even better. It will take us 12 hours to get there not including the side trips planned along the way. This all for the Great Grey Owl and yes other bird species too such as the Boreal Owl, Northern Hawk Owl, Hoary Redpoll, and Boreal Chickadee to name a few. Then of course there is the wildlife….pine martens, bobcat, moose, and timber wolves that we might get lucky enough to see. Yes, it will be an adventure! We may not see all of the above but we have high hopes. 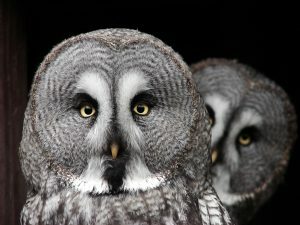 The Great Grey Owl is the biggee though (no pun intended). With its length at almost 3 feet and a wingspan of up to 5 feet it is a definite must see. Smaller than an eagle but larger than a Great Horned Owl just to give you an idea. Sax-Zim Bog is a birding hot spot right now as you can imagine. We have never been…..It is 300 square miles of bog, aspen uplands, rivers, lakes, sedge meadows, and farms. This is great habitat that attracts many boreal birds that come in from the far north from about December through late February. We will be driving around on the roads there searching and also doing some walking when necessary. With temperatures being so low added with the wind chill factor, it will really depend on how desperate we are to see our targeted birds. I’m thinking we will do what we need to do 🙂 Warm layers of clothing are all we need! More on this place in my next post after I truly get to experience it. The Great Grey Owl can be found in areas of Alaska and Canada although many are found around Lake Superior. This owl prefers swamp areas or dense wet evergreen forests. Great Greys have a large head with no ear tufts. The Great Grey Owl is mostly fluff weighing in at 2 – 3 pounds. Their diet consists of mainly voles but they will also eat squirrels, rabbits, chipmunks, weasels, and mice. If they are extra hungry they will also eat birds, ducks, and some small raptors. Great Greys only hoot when they are looking for a mate or raising young. They are considered nomadic. They only migrate if there is a scarcity of food. That is why some years there is an “irruption” of them in the United States. My brother-in-law was at Sax-Zim Bog in 2015 I believe, and got to see about 50 or more there. That is amazing! They do not build their own nests but rather utilize the old nest of ravens, squirrels, or raptors. They do not add anything to it to make it their own either. The Great Grey Owl usually hunts at dawn or dusk but may also hunt during daylight hours. They have excellent hearing as most owls do and can hear movement under thickly covered snow up to two feet. It will rarely fly but will listen for its prey and glide to capture it with its talons even through the snow to catch it. They consume up to a third of their body weight daily. Great Greys can live up to twelve years. My husband (Jeff) and I have downloaded a map of Sax-Zim Bog and have been following the Sax-Zim Bog Facebook page where people have been posting all of their sightings be it owls, birds, or mammals from the last few weeks. We have also taken notes of the various roads that the sightings have been made of each so that we know where to do our searching. So we are ready. We have our binoculars, video camera, and each of us has our own camera to be able to quickly snap a great photo of our findings. We even have walkie-talkies so that we can communicate with my sister and her husband if need be when the owl or other bird is spotted. Hopefully we will have as much success as other birders that have been lucky. I am counting on it! Stay tuned as Jeff and I plan on taking lots of photos and will also be videoing our experience as much as possible. 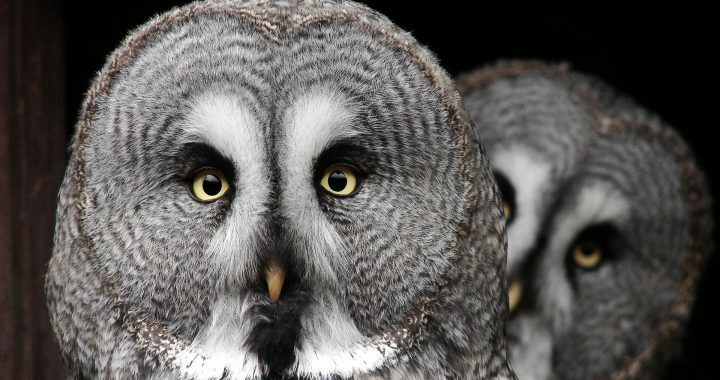 Have you been to Sax-Zim Bog and experienced the Great Grey Owl? Or have you seen one in another location? I would love to hear about your experience. Please make your comments below. 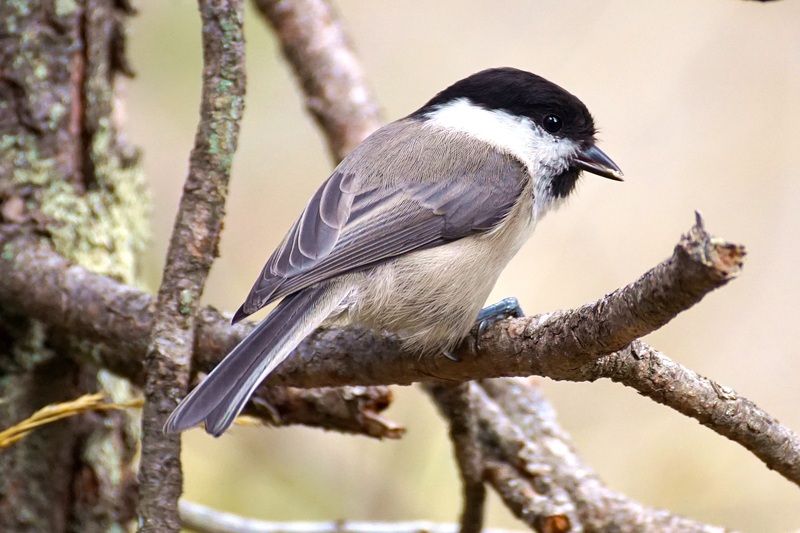 Posted in Birding Hotspots, Birding Vacations, Owls.